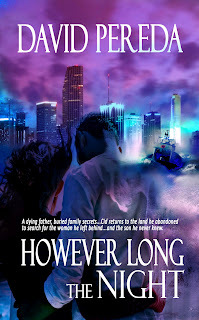 This post is a stop on a Virtual Book Tour organized by Goddess Fish Promotions. Leave a comment/ask a question and be entered into a drawing for a $20 Amazon GC. Our guest blogger today is award-winning author and college creative writing instructor David Pereda. 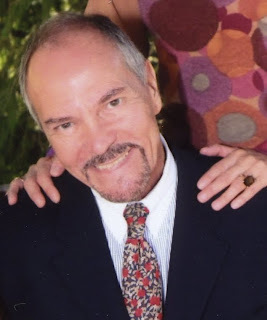 He is the regional director of Florida Writers Association's Western North Carolina division and the founder of Asheville Writing Enthusiasts (AWE). 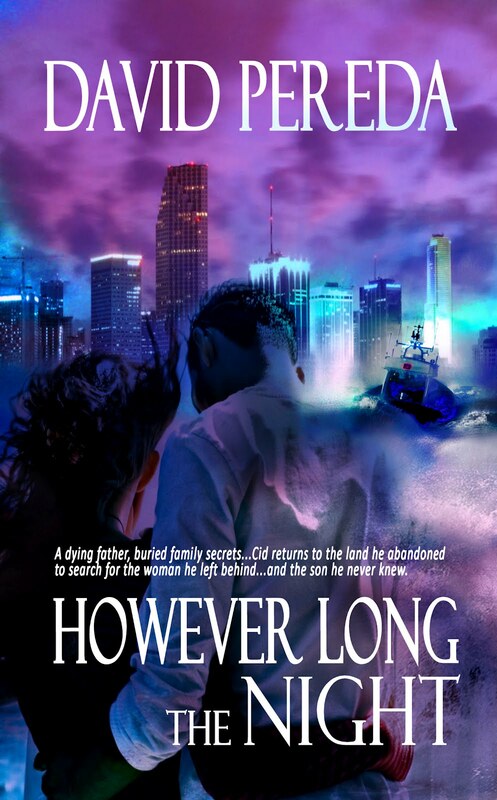 His latest novel, However Long the Night, published by Eternal Press on February 7th, has won two awards already and has been earning excellent reviews. LASR: What are some of the things beginning writers should do to improve their craft? David: First thing they should do is know the basic tools of writing and learn how to use them properly. LASR: Basic tools of writing – you mean like a hammer, nails, or a saw? David: Good analogy. Good writers, like good carpenters, know their tools and know how to use them. While a carpenter’s basic tools might be a hammer, nails and a saw, a writer has basic tools too. LASR: And what are those? David: The three basic tools of a writer are narrative summary, description and dialogue. David: That’s it. Those are the basic tools that help writers build memorable stories. The difference in the quality and poignancy of the stories has to do with how well or how badly writers use those tools – the techniques of writing. LASR: Would you give a brief description of those tools for our readers? David: Sure. Narrative summary tells readers what happens offstage. It’s a scene that is told rather than shown and is usually used to bring in the backstory – or “the history” of what happened before the story began. To use computer jargon, narrative summary takes place offline. The best use of narrative summary in modern fiction is simply to connect scenes. It should be brief and used with discretion. Too much narrative summary will bog down your story. LASR: What about description and dialogue? David: Description is the depiction of a locale or person. While description adds color and richness, it should be used sparingly. A hundred years ago, writers - who were often paid by the word -- indulged in pages and pages of description. Modern readers, "trained" by TV, film and the Internet, are much more impatient. So, however beautiful you believe you write description, don't overindulge or you'll lose your readers. LASR: I’d better watch that. And what can you tell our readers about dialogue? David: Dialogue is an invented language that resembles everyday speech. Dialogue in fiction breaks the monotony of lengthy descriptive passages, advances the action and lends insight and personality to characters. Pitch-perfect dialogue involves conflict, either internal or external. LASR: Thank you for being our guest blogger today, David. It’s been quite informative. Would you consider being our guest again in the future to discuss more writing techniques? David: It would be my pleasure. Thank you for inviting me to be your guest today. I want to thank you for having me on your blog today. Please let your readers know I will be available to answer questions and comments all day. I really hate to read a story where they use poor english and grammar. It puts me off immediately. I don't usually read books written by men but I like the storyline to this one. I also agree with momjane, can't stand mistakes. David...In your interview, you sound like a writing instructor...LOL! Always in the professorial role. Forgive me, Catherine Lee. I had my professorial hat on during this interview. I take writing seriously, very seriously. MomJane and Leanne, I agree with you -- except with dialogue. Dialogue is usually ungrammatical, conflicting and unexpected. Thank you both, and all the others, for your support. Day late again! But this interview setup is just too good to not leave a question so I hope you'll be checking back to leave an answer. As I've read in blogs by other authors, I'm struck by the fact there is a lot more to the writing process itself than just sitting down and writing a book. In your opinion, what percentage of 1) book-learning including but not limited to, college courses, reading how-to books); 2) seminars, workshops, association membership; 3) talent/imagination/life experiences; and 4) actual writing of a story is really involved in getting a finished published book? Thank you for explaining the three basic tools of writing. I did find it very interesting.